Is the sale of the Vasari archives a prank ? 27/10/09– Heritage–Arezzo, Museo di Casa Vasari –An amazing affair has taken hold of Italy recently. It is in fact difficult to understand how Giorgio Vasari’s archives, held in his native city of Arezzo and belonging to the Museo Casa Vasari, a private museum whose owner, Count Giovanni Festari, passed away a few days ago, could have been sold for the extravagant sum of 150 million euros to a Russian firm which has not disclosed what it plans to do with them. The mayor of the city, Giuseppe Fanfani, was told of the sale by the Sopprintendenza archivistica per la Toscana, who added that according to the law he has three months starting last 23 September to raise the same amount in order to pre-empt the archives, a number which corresponds according to him to five times the city’s budget. Vittorio Sgarbi, the famous art historian and former Minister of Italian Culture, known for his numerous antics and for his bluntness, asserts that in fact the value of the archives varies between 2.5 and 10 million euros, and that this is all a huge prank meant to twist the government’s arm into becoming interested in and acquiring the archives. Furthermore, it seems that there are patrimonial restrictions imposed on the archives and that they cannot be legally held in Arezzo. Who or what should we believe ? If the sale were confirmed, the general indignation would be more than justified. These archives, which include notably handwritten letters by Michelangelo, Pius V, Cosimo I de Medici, Aretino and many other of Vasari’s contemporaries, are obviously part of Italian national heritage. Giuseppe Fanfani officially addressed the President of the Consiglio , Silvio Berlusconi, requesting that he intervene to stop the sale. 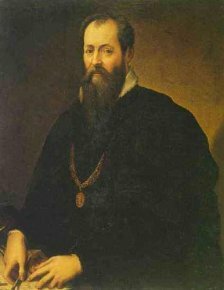 He has also threatened to cancel the festivities planned in 2011 to celebrate the five-hundredth anniversary of Vasari’s birth.